In the midst of Strapping Young Lad’s otherworldly barrage of guitars, screams, bass rumble, and samples, Gene Hoglan’s kick drums blast through in furious, amazingly accurate 32nd-note flurries. Hoglan, thirty-seven, was in on the beginnings of the thrash metal movement, joining Dark Angel when he was still in high school in Los Angeles. After several years he left to join the band Death, with whom he recorded two ground-shaking albums, including 1995’s Symbolic, which raised the bar for outlandish double bass integration. After meeting Canadian guitarist Devin Townsend, Hoglan was convinced to join Strapping Young Lad. 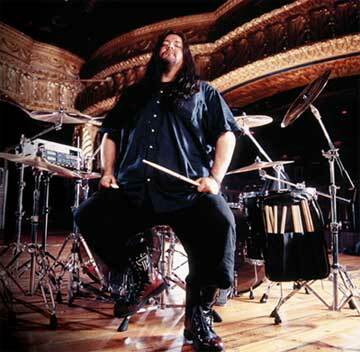 His impressive, over-the-top drumming can be heard on 1997’s City, 1998’s No Sleep Till Bedtime, and 2002’s SYL. After taking time off during the recording of a couple of Devin Townsend solo albums, Strapping Young Lad returned with a vengeance in 2004, releasing the live DVD For Those Aboot To Rock. Hoglan, known as “The Atomic Clock,” sat down with MD to discuss some of his favorite topics—thrash metal, haulin’ double bass drums, and the making of Alien, SYL’s craziest album yet. MD: Have you always taken a foot-oriented approach, sharing the lead with your hands and feet? Gene: I started off being a hand player, because I was really into Neil Peart growing up. He was my first super duper favorite drummer—after Peter Criss, of course. I think Peter was everybody’s favorite drummer, at least for guys my age. Neil was more of a hand guy. He played interesting stuff, but it was all understandable. It wasn’t like he was playing real nutty stuff that you couldn’t figure out. As I got a little older, I started getting into double bass drummers like Cozy Powell, Rob Reiner from Anvil, Whacko Hunter from Raven, and Filthy Animal [Phil] Taylor of Motörhead—he used to play a lot of fast double bass. I just started doing a lot of foot stuff, and after I started playing thrash metal it got to a point where I was like, Let’s do some nutty kick drum patterns. My feet can do it, my brain tells my feet they can do it, so the sky’s the limit on both sides. When I was in the band Death, we did a couple of records. One was called Individual Thought Patterns, and the other was Symbolic. By the time of Symbolic, I was doing a lot of hand stuff as well. So for me it’s about trying to balance both hemispheres, hands and feet. MD: What else did you listen to growing up? Gene: I grew up on American AM radio—from about ’69 to ’76—which is when I discovered rock ’n’ roll. I listened to all of the ’70s stuff that was big at the time, like Queen, Angel, Ted Nugent, Aerosmith, and Cheap Trick. I’ve always thought that Bun E. Carlos was an underrated drummer. When he got bored playing right-handed lead, he said, I’m going to play left-handed for the next few years. That’s cool. I’ve always been ambidextrous too, and it’s really helped out tons in my drumming. MD: You play open-handed on a right-handed kit. Gene: I’ve always done things with either hand. I suppose I’m right-handed, but I do many things left-handed. Playing left-handed on a right-handed kit is just the way I started playing as a kid. Every drummer I talked to tried to convince me to lead with my right hand and cross over with it to play the hi-hat. That didn’t make sense to me and I didn’t like crossing over, so I said screw it and made up my own rules as I went along. MD: Where did you grow up? Gene: I was born in Dallas and raised in Los Angeles. I saw every strip band, all the big hair metal bands of the day. I saw a ton of cool bands, too, like Metallica and Slayer, back when they were playing small clubs in LA. I was really young, and this was before they would card you drastically. When I was thirteen I looked old enough to be there, so nobody ever gave me a hassle. MD: You started playing with Dark Angel at a young age. Gene: Dark Angel formed in about 1981, and I joined in ’84. I hadn’t actually played double bass much before Dark Angel, but any time I’d get on a double bass kit, I just had an aptitude for it. It was easy for me to play double bass, so I went with it. Dark Angel was a pretty visceral thrash band. After we broke up in 1992, I got a call from Chuck Schuldiner of the band Death saying they were looking for a drummer. Sean Reinert, who played on their Human album, really opened up tons of avenues for technical playing and killer, speedy double bass. I was like, Wow, he’s shown what can be done here, so let’s go with that angle, as opposed to just playing some rudimentary drum parts. Let’s go nutty. I was really into Steve Gadd around the time we did Individual Thought Patterns. Gadd’s bembe beat on the early Al Di Meola stuff was a big influence on me. That was a really cool beat to me, a cool way to break up a 6/8 pattern. So instead of just going “chugga chugga chugga, chugga chugga chugga” on the kick drums, I went nutty with the hands too. I had started to play with two rides at that time, one on either side of the kit, and I was doing some crazy ghost note-y things on the second ride. That was kind of inspired by Gadd. Then by the time we got to Symbolic, I was super duper into Deen Castronovo as well. He’s an awesome double bass drummer. Terry Bozzio was huge for me, too, and Mark Craney as well. I grew up playing along with Gino Vannelli’s Brother To Brother record. Craney was awesome on it. MD: I’ve noticed in your work with Strapping Young Lad that your drum work involves setting up other licks, almost like a big band drummer. I noticed it on “Zen” [from Alien] quite a bit. Gene: Well, I always try to do that. If I’m going to be playing a pattern three times in a song, the first lick will be the simplest one, the second will be a little more advanced, and then the final lick is going to be me throwing it all against the wall. I’m not sure if I do that necessarily with “Zen,” but I do try to consider the entire song when I’m coming up with parts. Don’t blow your wad the first time you play a lick. If you’re going to come back to it later, build on it.